Unusual for an English company, Lagonda was founded by an American, Wilbur Gunn, beginning in Staines as the manufacturer of the Tri-car. From 1907 until the 1920s light cars being the theme, their 11.9hp offered competition for a while to the 11.9hp Morris Cowley. 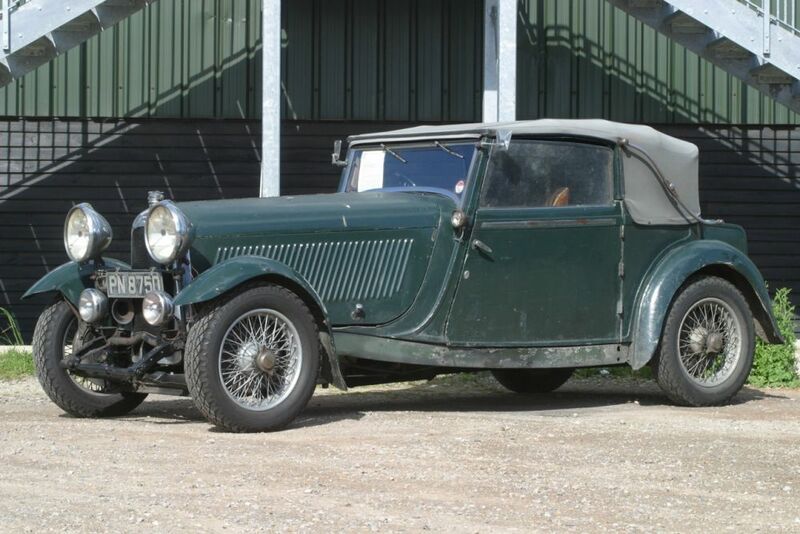 While Morris concentrated on mass production, Lagonda decided to produce top quality cars for the discerning. From the mid 1920s the firm concentrated on sports cars and tourers in the main. A new engine designer, Arthur Davidson, was brought in from Lea Francis when he introduced the 14/60 in 1926, the new 2-litre 4-cylinder sporting engine featuring twin, high mounted camshafts operating inclined valves in hemispherical combustion chambers. Power output of this advanced new design was a respectable 60bhp. This engine was to propel Lagonda production into the 1930s, the Speed Model from 1927 featuring improvements to the chassis, camshaft, con-rods, lubrication and brakes. For the 1929 season a new ‘Low Chassis’ Speed Model was introduced, featuring revisions to the frame’s front end and a higher compression engine fitted with twin carburetors. 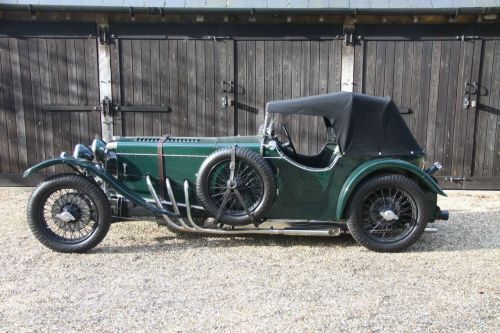 In 1930 a supercharged version was introduced, the Powerplus blower mounted vertically and in front of the engine, feeding a Cozette carburetor, a stronger crankshaft and a 3-litre axle. 80mph plus was capable under normal aspiration, 90mph with the optional supercharger, and an acceptable 18mpg feeding from a 20 gallon fuel tank. Long distance trials and rallies were of immediate appeal to owners, this model being considered as one of the most usable and enjoyable vintage and PVT sports cars around, its supreme versatility proven time and time again on road, rally and race track events, Lagonda firmly establishing itself at Brooklands, and later of course at Le Mans. This appealing 2-litre carries original and most attractive lightweight aluminium Drophead Coupe coachwork by the highly respected coachbuilders, James Young, suppliers to rival premium manufacturers of the time such as Bugatti, Hispano Suiza, Rolls-Royce, Bentley and Talbot, but probably best known for the Drophead Coupe bodywork fitted on the Alfa Romeo 1500 and 1750 models, similar to the Lagonda offered today. 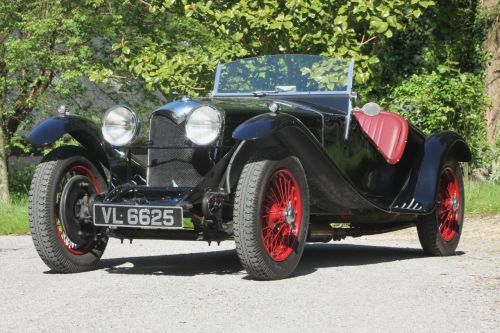 In one ownership since 1958 by a senior chemist with an internationally known oil company, this all-original 4-seater Lagonda drophead coupe is the subject of an Executor sale. 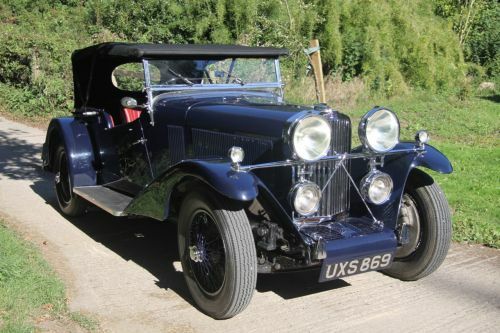 Understood to have originally supplied as a supercharged model, this Lagonda was last used by the late owner last Summer on a return trip from the south coast to Yorkshire. Originally registered to a Mr Harold Arthur Barham, simply of “Snape”, Wadhurst, East Sussex, he kept the car for exactly two years, the annual rate of duty then as much as £13! This time-warp aluminium-bodied car with nicely original upholstery comes with its very first logbook, signed and dated by the first owner 2nd January 1932, together with continuation log books indicating almost all of the cars’ history. From Sussex to London, Bath, Plymouth, Royal Naval College Greenwich, and naval association from 1946 to 1954, the present owner has owned this car from 14th March 1958, just over 2/3rd of the cars’ total life!